Apparently vanity plates are very inexpensive in New Hampshire, as evidenced by the fact that nearly everyone has one. I actually take bizarre joy in walking through parking lots now that I live here because there are so many ridiculous vanity plates to be found. My apartment complex's parking lot is jam-packed with them; the parking lot of the bus station is the best place to go plate-spotting because it's, like, the largest lot in the world. Or at least in New Hampshire. Needless to say, I've been gathering photos for this post for awhile now. I actually had even more to choose from (60ish in total! ), but I decided to cut 'em down for the sake of highlighting the really good stuff. 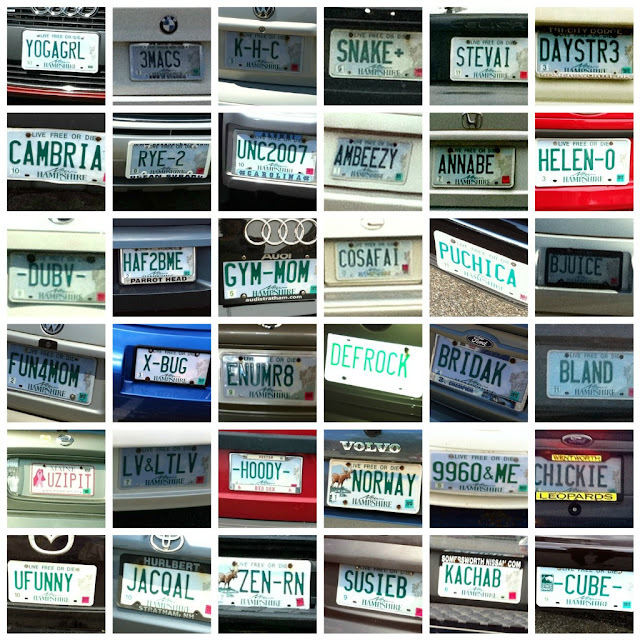 Ladies & gentleman, I present you with 36 of the most stellar vanity plates in the Portsmouth area. When I was 16, I drove a Dodge Colt (read: CLUNKER) & was desperate for a vanity plate that read "K8SCOLT." God bless my mother for refusing to shell out the cash for that atrocity.